(Not her -- I was too preoccupied to pull out my camera -- but she looked like this. I ducked into a store today to get something small for my sweetie that I will need when I see him next when I heard a bird chirp way in the back. A bird in the store! I had to go see it. I put down the two items I was comparing and headed for the sound of the chirping. Sure enough, a frightened, young sparrow rested on the floor breathing heavy, having exhausted itself from looking for an exit. Birds prefer high, safe perches. If one's on the ground in a land of giants, it must be spent. 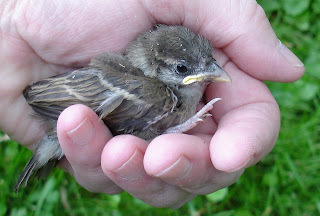 It looked like a young female house sparrow. I stood away from her purposefully not lunging and tried to do that thing that worked for my parakeets: get them used to my presence. I extended my hand slowly so she could observe it; with my outstretched hand, came an offer. "Here, hop on this? It is a magical vehicle that will bring you what I can see you desire most: freedom." She eyed me and turned her back. "No thanks, I'm good." But she didn't fly away -- that's something, right? I was surprised she wasn't terrified of me but I have a history of rescuing birds, maybe word got out. We stood there a moment but then a clerk came over and she bolted. I followed her around the store at a calm speed so it wouldn't feel like I was a predator stalking her. Everywhere she stopped, I stopped, holding up my outstretched hand and crooning softly to her. If I could have spoken bird, I would have said, "Hi again! I know I'm 8,000 times larger than you and most of us aren't that nice but I swear, I know you just want to be outside. Let me help." Staff came over and one of them handed me a broom. Another one held a plastic bag to throw over the little bird like a net. "Thank you, but that will scare her," I told them. "Here, let me try it my way for a bit." She flew away again but I found her resting on a top of a clothes rack trying to catch her breath. I slowly inched my hand towards her again until this time I was almost touching her. When she didn't flinch, I gently closed my palm around her, scooped her into my cupped hands and began speedwalking towards the front. I got her! But in my earnestness not to harm this delicate creature (bird's bones are hollow and especially fragile and they can even have a heart attack from fright), I wasn't holding her tight enough and she got away. Snap! We went through the dance again, her circling the store while I walked deliberately her way. Soon, another opportunity presented itself and I again got my hand close enough to cup around her but this time, I held her more tightly. Once outside, I released her in a bush, opening my hand amidst the branches so she could see she was now free and leave of her own volition. She laid in my palm for a moment looking around, confused. Then she looked at me one last time and flew high into a tree and my heart soared with her. Nice of you to save that bird. I didn't know it was possible to get that close to a wild bird. It normally isn't -- this one was a baby bird so I think it hadn't yet learned to be as wary of people. I was surprised though that she let me get close enough to touch her a second time -- I thought for sure that one time was all that'd be needed for conditioning. I think moving very slowly helped though. I have some experience caring for birds and found that this seems to make them feel safer.